Deuteronomy 27:15 "cursed be upon the man who maketh any graven or molten image, an abormination unto the lord, the work of the hand of the craftman, and putteth it in a street place, and all the people shall say Amen" The scripture foretells that whosoever worships or bow down to any engrave images or idols are cursed because it's an abomination unto the Lord God Almighty, the Lord whom created heaven and earth is a jealousy God and wants the whole earth to worship and glorifies his holy name. Exodus 34:14 "For thou shalt worship no other god: for the LORD, whose name is Jealous, is a jealous God"
For people who also admire the images and Idol when they get to the market place where it's placed, They are cursed. People now spending their money on it to buy it, They are cursed. Bringing it into your house, You and your house are cursed. Then Bowing before it, You are cursed. 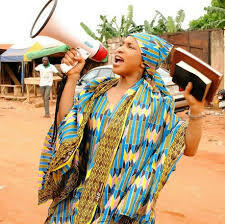 And every congregation shall say amen. Danger Of Worshiping And Bowing Down To Engrave Image. Deuteronomy 7:26 "Thou shalt not bring an abomination into thine house, lest thou be a cursed thing like it: but thou shalt utterly detest it, and thou shalt utterly abhor it; for it is a cursed thing. Many has brought in abomination into their homes, and this has cause their prayers to be hindered in many ways. The lord can never enter into a house filled with abominations. Just a single abomination will chase away the holy spirit out of your house. No wonder you always have bad dreams, no wonder you and your husband are always fighting, no wonder your children are so rebellious, you cannot have evil demon in your home, and you won’t expect it to do what he’s meant to do, but hear the warning now, get rid of these things from your house, only what you need is the holy spirit. 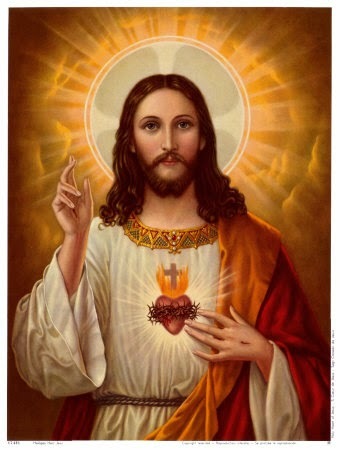 Who Is This Image People Called Jesus? Ezekiel 7:22 "My face will I turn also from them, and they shall pollute my secret place: for the robbers shall enter into it, and defile it. Get these things out of the church, you don’t know whose image it belong to, 2 Corinthian 11:14 "And Satan himself masquerades as an angel of light. Revelation 13:8 "And all that dwell upon the earth shall worship him, whose names are not written in the book of life of the Lamb slain from the foundation of the world. We have been brain-washed from the very beginning. There are so many facts to prove that this image is not Jesus Christ but a fallen angel. Jesus was a Jew, and Jews don’t wear long hair. It is a disgrace for a Man to wear long Hair 1 Corinthian 11:14. It is forbidden to depict God in the arts made to look like Mortal Man Romans 1:23, i.e. No draw god for paper or calve his image. God deserve more respect than that. Understanding of these facts. 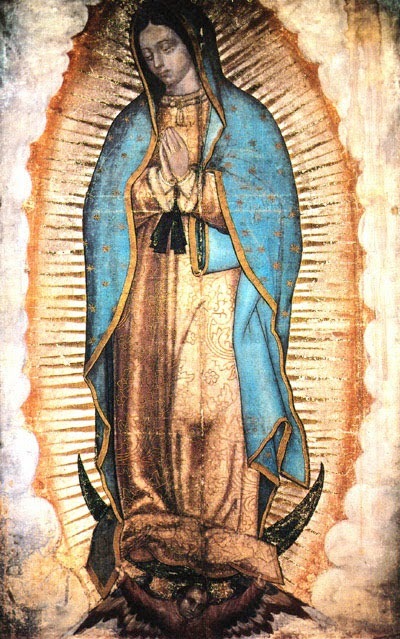 It is very forbidden to even bring these kind of images into your house talk less of having it in the church. When was camera invented, in 1900 camera only snapped black and white color. And Jesus came to earth 2000 years before camera was invented. Then who snap him? Even the image snapped in 1960 was not even clear as that of Jesus, use your brain my friends and throw away that demonic pictures from your house. READ ALSO: The Backsliding State Of A Christian. Reasons; You Must Not Worship Images Of Mary And Jesus. Now look at the attached image, why are all these images has the same hand gestures. 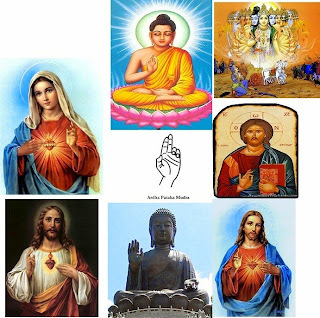 This hand sign is known as Ardha, pataka, mudra, abode of the the gods. It is generally known as ardha pataka. Who can tell us the year they invented camera and deduct it from 2000 years ago when Jesus was on. You have all being brain washed. Many churches use this image as a symbol of Christ in their churches today. But believe me or not, you are hanging a demon in your churches or houses. Even if you are not the one who drew it, you have supported those that drew it, that is why you have it in your home and churches. Do not be deceived by its outer appearance on earth? And what kind of camera did they used to snap him when he was alive thousands years ago? I know many of you will have hard time believing this as you have always been. You are angry, offended, and confused. Fight that hypnotic in your mind and wrestle it with the truth. be awakened, free your mind. READ ALSO: How To Start A New Life In Christ Jesus. They remove human heart to serve the gods called QUETZALCOAT. 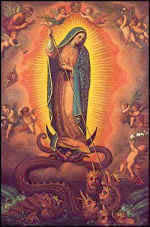 So the so called Jesus is not Jesus but Quetzalcoatl gods. The heart is what they do to their victims, by removing their heart in name of Quetzalcoatl. And this are the knife used in removing their heart. But today, whose sacred heart does this savage ritual belongs to? Why is he holding a heart? Why are knives stuck in the heart of this sacred heart icon? Why are there knife punctures on this sacred heart icon? 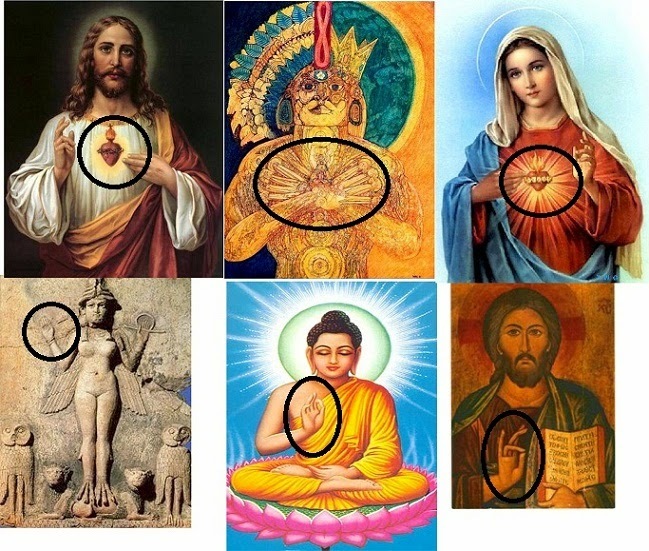 Are you sure this image belongs to Jesus? Why is he always pointing to this heart? Or are you deceived into worshiping the image of the beast which bears many names-Saturn, Stur, El, Ninurta, Quetzalcoat1. Ezekiel 14:6 "Therefore say unto the house of Israel, Thus saith the Lord GOD; Repent, and turn yourselves from your idols; and turn away your faces from all your abominations. 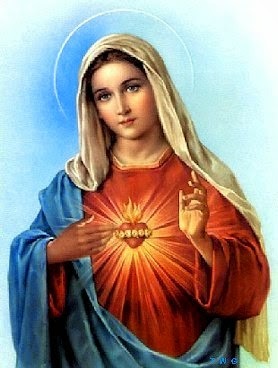 Who Is This Image called Mary? It is commonly known as the moon goddess and represented by the crescent moon symbol, kindly observe the crescent moon that appear in all her images. 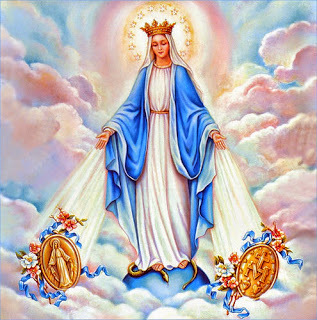 But why do catholic call Mary queen of heaven? Does any references shows that Mary queen of heaven in the bible? Why is she standing on dragon serpents? 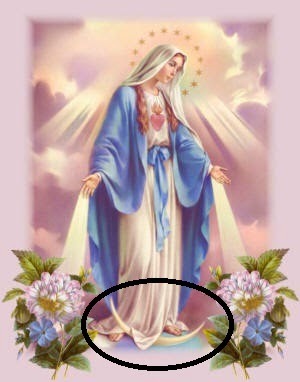 Why is she standing on crescent moon? READ ALSO: 990 Years In The Kingdom Of Darkness. Jeremiah 7:18 The children gather wood, and the fathers kindle the fire, and the women knead [their] dough, to make cakes to the queen of heaven,and to pour out drink offerings unto other gods, that they may provoke me to anger. Jeremiah 44:17 But we will certainly do whatsoever thing goeth forth out of our own mouth, to burn incense unto the queen of heaven,and to pour out drink offerings unto her, as we have done, we, and our fathers, our kings, and our princes, in the cities of Judah, and in the streets of Jerusalem: for [then] had we plenty of victuals, and were well, and saw no evil. Jeremiah 44:18 But since we left off to burn incense to the queen of heaven,and to pour out drink offerings unto her, we have wanted all [things], and have been consumed by the sword and by the famine. READ ALSO: Danger Of Pride And Disunity In The Church. Jeremiah 44:19 And when we burned incense to the queen of heaven, and poured out drink offerings unto her, did we make her cakes to worship her, and pour out drink offerings unto her, without our men? Jeremiah 44:25 Thus saith the LORD of hosts, the God of Israel, saying; Ye and your wives have both spoken with your mouths, and fulfilled with your hand, saying, We will surely perform our vows that we have vowed, to burn incense to the queen of heaven, and to pour out drink offerings unto her: ye will surely accomplish your vows, and surely perform your vows. For those that has this images in their homes, when it's 12 am midnight, till 2:am, sit in front of the image and keep watching it, perhaps you will see what we are talking about. Just be bold and make sure the name of Jesus is closed to your mouth. Ask the Lord to open your blinded eyes to see things about the image you are sitting in front then start staring at it from then on. And for those still bowing down to them, especially the Catholics, Priest, Pope, Reverend father and her members. I praise the Lord for your life, for leading you to this post. You wouldn't have any excuse to render unto him, when you shall appear before him to render account of your earthly journey. Moreover, many popes and idolatry worshipers of grave image of Jesus And Mary are already having their punishment in the pit of hell. Which i believe, has made me to write this post, so as, you could pray, for the lord to direct and open your spiritual eyes to the implication of having engrave images of Jesus or Mary in your home and dangers of worshiping or honoring them. 6 Responses to "Danger Of Worshiping An Engrave Images Of Mary And Jesus"
THENew Testament was writtern after the death and resurrection of Jesus Christ by Filling of the Holy Spirit on the authors of the Gospel of Jesus Christ.Image has no value and we have to Beliieve God in Faith.We can see God image when we meet Him in heaven and we cannot see God 's image when we are in earth.As u say there could be artists then why in New Testament Jesus Christ did't tell a Word keep an image in the Bible and Worship me?If He tells that Ten commandments will be of no value.image cannot move and teach. Word makes a person move and teach. The Lord is your divine empowerment my beloved; because flesh and blood can't reveal such deep secret unto you. Thanks for the godly answered and contribution. He who have ear let him hear. i discussed this with someone when i read it but the person was against the writer. but i checked it for myself and i saw the truth. bro paul pls keep your good work you are changing lifes. may God bless you and empower you in jesus name.